Have you kitted out your new Blackmagic Design URSA? Take a few minutes to browse some new and essential accessories for Blackmagic Design cameras below. We have added several new accessories including battery power solutions, shoulder mount kit and front rail block for the BMD URSA. Blackmagic Design has officially released their software package that will allow you to update your Blackmagic Camera to the latest firmware release. Initially, the update was surprisingly released without notice and then quickly removed. Blackmagic Design addressed the posting as an unknown leak and advised users no to install it until an official release is made. Now that we have the BMD approved release, here is a run down of the final improvements and fixes. - Wooden Camera Accessories Just Added! Having just added all of Wooden Camera's accessories to our site, we would like to invite you to check out a few new products recently added to their wide range of camera support and mounting product lines. Wooden Camera's featured products include a new NATO standard quick release handle, universal lens supports and quick release plates for Blackmagic, Sony, Canon, RED and more! 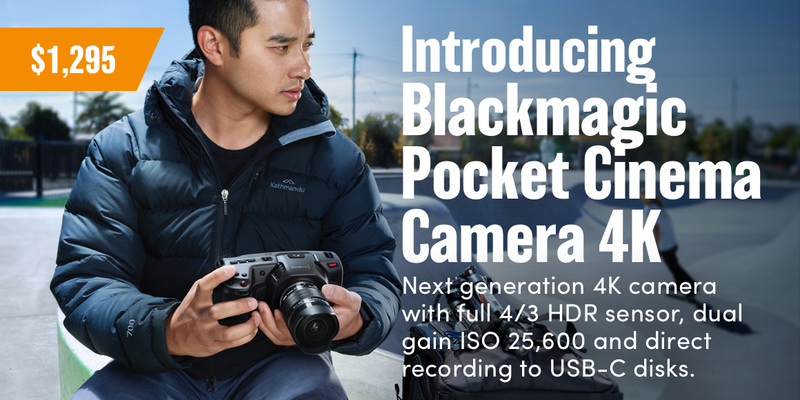 - Pre Order Your Blackmagic Design URSA or Studio Camera 4K Today! Available For Pre Order Now - The Blackmagic Design URSA PL or URSA EF turret mount cameras and the Blackmagic Design Studio Camera 4K are now available for pre order at Innocinema today! To secure your pre order slot a 10% deposit will be required when you place your order. The remaining balance of the total will be charged at the time of shipping. Estimated shipping for the URSA PL & EF is slated for July 2014 and the Studio Camera 4K is expected in June 2014. Just announced at NAB 2014, Blackmagic Design has just introduced their newest additions to their line of cameras. The Blackmagic Design Studio Camera HD delivers 10-bit 4:2:2 video at 1920 x 1080 resolution and The Blackmagic Design Studio Camera 4K is world’s first 12G-SDI broadcast camera for live Ultra HD production with 10” viewfinder, 12G- SDI, MFT lens mount, support for up to 2160p60, 4 hour battery, talkback, tally and more. "Over the last few years it’s been really amazing to watch some of the work being done on our cinema camera and some of the rigs that have been built around it. But when we designed it we never really thought it would be used on such large jobs. It was really designed to be a small intimate camera used for creative work where you need to get in close and personal..."
We were able to snag a few photos on the floor at NAB of Blackmagic Design's newest cameras. First up the Blackmagic Design Studio Camera show below. - Blackmagic Production 4K Camera Shipping Now For $2995! Blackmagic Design has announced that the Blackmagic Production Camera 4K is now shipping and with a new low price of US$ 2,995. This new low price will be available for all customers, including existing pre-orders.